Queensland has always been known for its extremes. Though this often takes a naturalistic quality – from the sheer size of the state to its extreme disparities in climate and weather – a propensity for radical politics is another of its supposed eccentricities. This idea, part of a broader thesis on Queensland’s ‘difference’, ignores not only the importance of international ideas and actions on the tradition but also the real divisions which exist. A primary discontinuity can be seen between a late nineteenth/early twentieth century radicalism, centred on primary production and union-based struggles for wages and conditions, and a late twentieth century movement to the metropolis with activism around issues like civil liberties and the war in Vietnam taking centre stage. Yet this apparent rupture hides some nuanced continuities – both in the transnational nature of the activism itself and in the role gender has played in such struggles. The further one moves from Brisbane, so this narrative goes, the more pronounced Queensland’s eccentricities become – with the state’s separatist Far North often caricatured as a case study in a peculiarly regional populism. With its early development based heavily on primary, often seasonal, industries such as sugar, mining and logging, by the 1920s the region had given rise to a workforce marked by itinerancy, low wages and a consequential militancy. 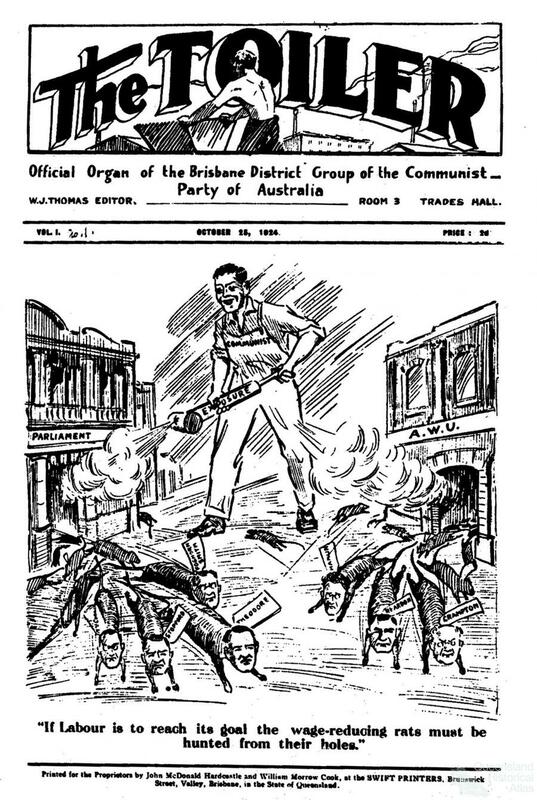 Worker demands often went unsatisfied by the Australian Workers Union (AWU) – which represented the vast majority of these workers and constituted the backbone of Queensland’s ‘socialist’ Labor government. This government’s anti-worker reputation, cemented by the Railways dispute of 1927, which saw 19,000 workers locked out, led to a growth in working class dissent – particularly in the sugar growing region between Ingham and Atherton. 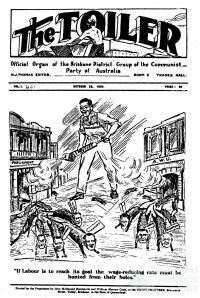 The Communist Party of Australia (CPA) played a key role in this agitation. A staunch enemy of the AWU, the CPA’s post-1935 'Popular Front' policy advocated renewed work in existing unions as part of a general policy against global fascism. This was a well-timed move for North Queensland members. The region’s clear class distinctions alongside a growing left-wing migrant presence – with the Italian population of the region expanding five times over during the period from 1921 to 1933 – provided otherwise fertile ground for agitation. The failings of the AWU were also well known in the working class’s lived experience, with Jean Devanny describing in her 1936 Socialist Realist work Sugar Heaven how ‘the union officials have been isolated from the workers…their treachery has been so open’. 1935 saw a drastic increase in instances of rat-borne Weil’s disease in the region's cane fields, with communists – many of whom AWU delegates or acknowledged leaders – profiting from union inaction over workers concerns by launching an unauthorised strike, which soon became general across the local industry. While ultimately unsuccessful the strike galvanised the radical cause in the ‘Red North’, culminating in the election of communist Fred Paterson to the State seat of Bowen in 1944. On closer inspection, it also illustrates some nuanced continuities with patterns of activism in the 1960s. Brisbane has never been a stranger to radicalism or riot. The city has hosted many militant industrial disputes as well as a vibrant history of organised youth activity from the 'Barjai' groupings 1940s meetings in the Lyceum Club to a vibrant scene of ‘bodgies and widgies’ around local nightspots a decade later. Its position as a centre for radicalism only increased in the post-war period, as agricultural mechanisation neutered the ‘Red North’s’ working class support base. Meanwhile the dual effects of Cold War anti-communist rhetoric in the 1950s and the 'Grouper'-inspired split in the ALP of 1957 worked to destroy or marginalise support for radical causes in the Labor movement. The city itself was also changing, with its population expanding rapidly to 500,000 in the late 1950s. The number of university students was also growing due to the post-war baby boom and increased federal funding to higher education. The 1967-68 civil liberties struggle symbolised the rebirth of a globally conscious radicalism in this new political-cultural landscape. By the early 1960s, small groups of students and staff on the University of Queensland in leafy St Lucia, joined by a smattering of young workers from the inner city, began to take notice of Australian racism and the unfolding conflict in Vietnam. Campus organisations like Society for Democratic Action sought to combat such injustices, which were understood as part of a global system of organised inequity, under the leadership of such noted rabble rousers as Dan O’Neill and Brian Laver. Civil liberties arose as an interrelated issue to these global concerns, with the Queensland state treating any example of organised dissent as a threat to public order. 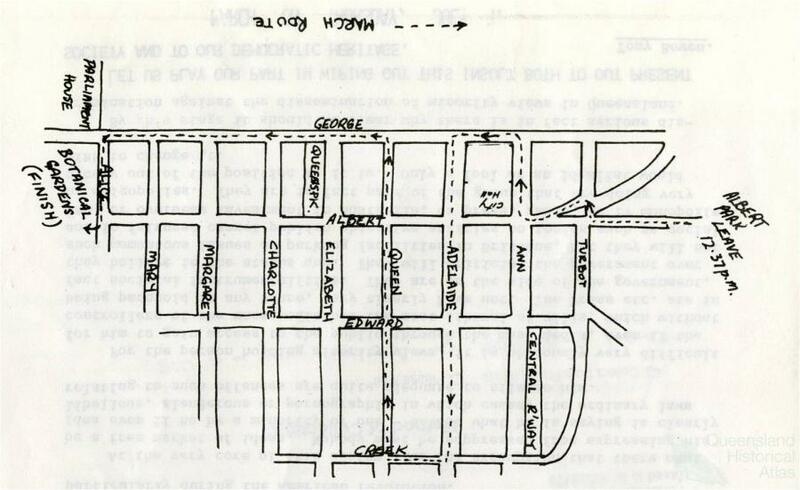 Large demonstrations of students occurred seeking to make changes to the Traffic Act 1949 which placed restrictions on pamphleteering and the right to march. 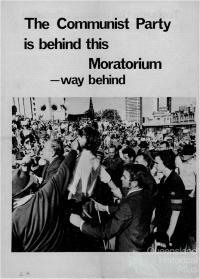 One such demonstration on 7 September 1967 attracted 4000, culminating in the arrest of 114 participants in what was described by the conservative Courier-Mail as a ‘MOB PROTEST’. Feminism formed a central axis of these movements, and an exploration of this theme reveals continuities and divergences in both contexts. While gender equality was a core concern of Marxist theory, women constituted only 16% of Communist Party membership during the Popular Front period. ‘Front’ organisations, called Women’s Progress Clubs, formed the key means of feminist organising in the Far North – attracting many wives and daughters of strikers. These organisations, which proliferated across strike-hit regions, sought to involve women in charitable work for the strikers as well as agitating for ‘public utilities relevant to women and children’ ranging from ladies retiring rooms in major cities to a children’s hospital in Townsville. Jean Devanny’s protagonist in Sugar Heaven, Dulcie, is involved in one of these groups. A conservative figure, Dulcie is gradually radicalised through her playing a leading role in strike support work. It is notable, however, that this transition is one mediated by her working class husband and easily fits the ‘hegemonic’ role accorded to women in the Far North. Thirty years later, and in a very different location, two women described by the somewhat perplexed Courier-Mail on 1 April 1965 as ‘married to University of Queensland lecturers … and each the mother of two children’ chained themselves to the public bar in Toowong’s Regatta Hotel. Rather than merely advocating women's rights or organising around ‘support’ work, Merle Thornton and Rosalie Bogner physically insisted on being served at a public bar – then directly banned under the Liquor Act 1912 – and inadvertently gave birth to a tradition of direct action within the Second Wave feminist movement. This conquest of a masculinised space and landscape – part of a broader campaign by a group of university based ‘New Left’ radicals to conquer public spaces through street marching and establishing radical centres, as well as introducing taboo topics as contraception and masturbation into the public lexicon – has been widely hailed as a radical departure from older forms of feminist politics. 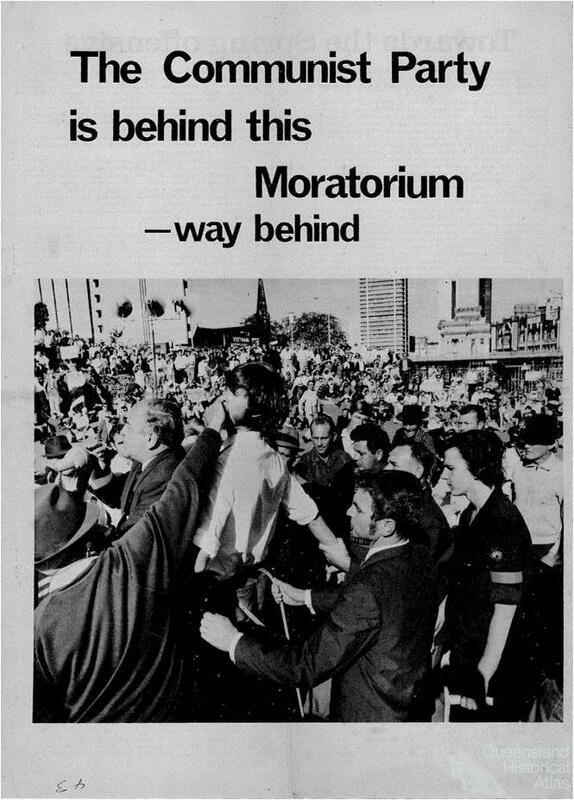 While capturing the continuities of feminism within Queensland’s radical tradition, this example also illustrates the discontinuities between a male oriented, rural activism – which saw women’s role as subordinate to the broader class struggle – and a new breed of young, cosmopolitan activists who saw feminism as central to a broader struggle over the values and practices of a society they saw as morally bankrupt. It seems clear then, that Queensland radicalism – too often denigrated as mere populism, as in the recent example of Pauline Hanson’s One Nation movement – is consequently a much more complex beast than traditionally conceived. It hides some nuanced continuities and interesting disjunctions for those willing to look beyond the dominant narrative. “Organisation is for the purpose of developing the latent talents of the women. See how we live! Nothing uplifting about our lives is there? We’ve got no objective. We live and breed and die. Life isn’t meant to be like that. Life is meant for joy and expansion and objective living. I think it’s the job of women to rear a race of young who will live better lives than we live; who will be able to create a better world than we, their elders, have been able to create. It’s not a question of what women can do; it is what can’t they do? We’ve got to bring the women closer to the men, to an understanding of the men’s work problems. Look at the Country Women’s Association! It’s everywhere in the North. There’s its big hall in the next street. But does it benefit the working women? What part has it played in the strike? As an organisation it has been utterly opposed to the strike. We should have been working in that…” (p246). “Well, it’s the result of years of work, of course. The union officials have been isolated from the workers. Their treachery has been so open. And we’ve done some good work.” Very modestly. “The non-party workers know what to do with the minimum of guidance from the Party. On one side stand the bosses; on the other the men. We haven’t the complicating factors they’ve got down south in the industrial areas. The non-party workers can see the struggle, therefore its easy to wage it. Comparatively. They know the Communists are fairly decent chaps, too. They live with us and know all there is to be known about us. Experience has taught them that we know what we’re talking about.” (p298).